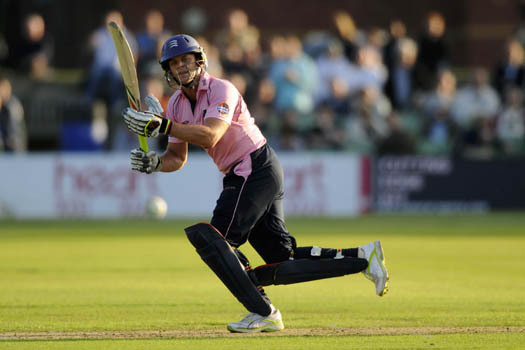 Adam Gilchrist, Middlesex’s star signing for the Twenty20 campaign, has smashed his way into the lead for this year’s Walter Lawrence Trophy with a blistering 47-ball hundred. 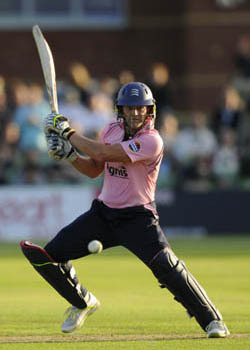 The 38-year-old wicket-keeper/batsman thumped 9 fours and 7 sixes during his century in the victory over Kent at Canterbury, in the Friends Provident T20 match on June 11th. 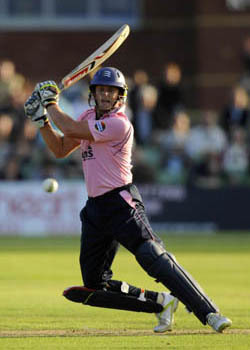 Following Shaun Udal’s dramatic resignation as Middlesex captain on the afternoon of the match, Gilchrist was thrust into the role of skipper and responded in flamboyant style by guiding his side to a six-wicket victory over the Kent Spitfires with 106. One of the most fearsome batsmen in the game, Gilchrist retired from international cricket in 2008, having played in 96 Tests and 287 One-Day Internationals for Australia. His astonishing strike-rate in Tests was 81.95 per 100 balls, and in One-Day Internationals an awesome 96.94. Rory Burns of Cardiff MCCU is the 2010-season winner of the Walter Lawrence Trophy award for the highest-scoring batsman from the six MCC Universities. The 19-year-old left-handed opener and wicket-keeper hit a sizzling, unbeaten 230 against Oxford MCCU, in the MCC Universities Championship match at The Parks on April 27: the highest score in an innings played against one of the other five MCCUs or against one of the first-class counties this season. Click here to view the Rory Burns press release.